Located on the north shore of Oosta Lake, the park provides camping and boat access to North Tweedsmuir Park. A free-standing interpretation and information kiosk is located near the boat launch and wharf. It contains park information on Andrews Bay and North Tweedsmuir, as well as other important safety and conservation messages. 95 km south of Houston. From Houston, head west on Hwy 16 and turn south onto the Morice Forest Service Road (the Huckleberry Mine Road, Freq 159.780). Follow this for 81 km and turn left onto the Shelford FSR (Freq 159.600). Follow the Shelford FSR for 21 km, left onto the Andrews Bay FSR for 300 m, then turn right at the signed park entrance and drive 2 km further to the campground. From Burns Lake, head south across Francois Lake. Continue south on the main road from the ferry for 17.5km, then right onto the Keefe’s Landing Road (Ootsa-Nadina Road). Drive 42.5km on this road and turn left on the Shelfort #1 Road (Little Andrew’s Bay FSR). Follow this for 22 km to the signed park entrance, turn left and drive 2 km further to the campground. Conservation: The park protects part of the Nechako Upland ecosection and the Ootsa Lake reservoir system. Approved Management Direction Statement [PDF 361.68KB] for Little Andrews Bay Marine Provincial Park is available online. Little Andrews Bay is a sheltered area suitable for smaller boats, but visitors wishing to venture further onto Ootsa Lake should use extreme caution. Large waves can develop very suddenly and you don’t want to find yourself caught out in open water. Fishing for rainbow trout can be very rewarding. Anyone fishing or angling in British Columbia must have an appropriate licence. 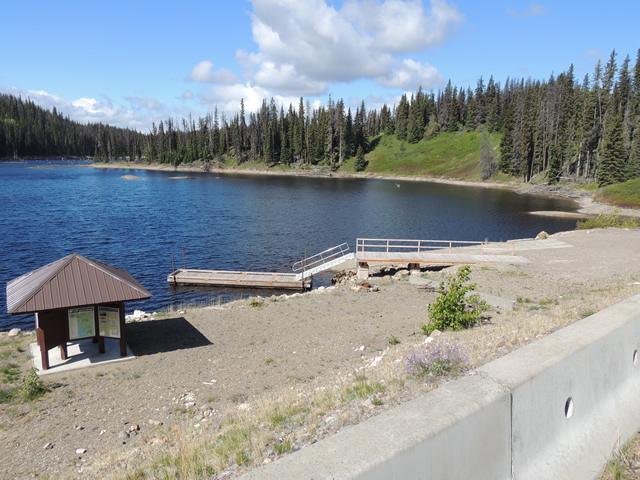 A concrete launch provides access to the Ootsa Lake reservoir and North Tweedsmuir Park. It has a gentle grade and is singlewide. There is also a floating wharf for mooring boats. Trailers can be parked and boats moored overnight but space is limited. Firewood is not available at this park, visitors must provide their own. To preserve vegetation and ground cover, please don’t gather firewood from the area around your campsite or elsewhere in the park. Dead wood is an important habitat element for many plants and animals and it adds organic matter to the soil. You can conserve firewood and air quality by keeping your campfire small. Limited burning hours or campfire bans may be implemented and some parks may use communal fire rings. Be prepared to bring a portable stove for cooking. Lake water is available; please boil before using. This park offers vehicle accessible campsites on a first-come, first-served basis – campsite reservations are not accepted. There are no camping fees. Eight campsites are available; each have a fire ring and picnic table. The park is open until the snow flies, then it becomes inaccessible until the spring melt. Operational window is usually May 1st to October 31st.